Hmannan Yazawin. Royal Historical Commission of Burma. 1832. Pe Maung Tin. The Shwe Dagon Pagoda. 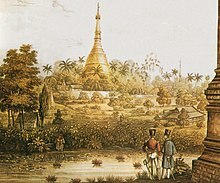 Journal of the Burma Research Society. 1934: 1–91. Martin, Steve. Lonely Planet Myanmar (Burma). Lonely Planet Publications. 2002. ISBN 978-1-74059-190-4. Elliot, Mark. South-East Asia: The Graphic Guide. Trailblazer Publications. 2003. ISBN 978-1-873756-67-6.